Romanian studio Square One have completed a clothing store in Bucharest with pointy display stands and a network of black electrical cables. Called Entrance, the monochrome interior features light bulbs weighted at the ends of electrical wires that create angular lines fanning out over the ceiling. 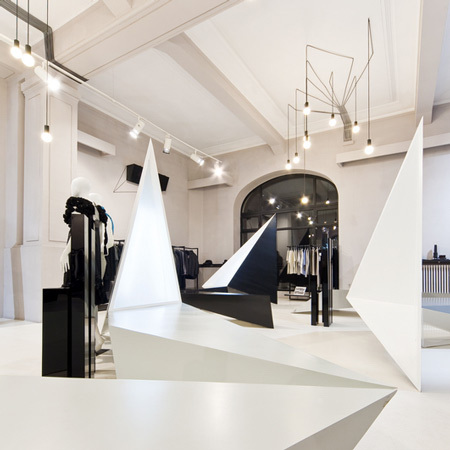 Angular display stands extend triangular volumes towards the ceiling. One side of each emits light to illuminate the merchandise. The concept began by trying to transform a space of 200 sqm in an allegory. Imaginary animals that abide in a surreal forest, a refuge, a route. Thus it might sound pretentious, technical and formal achievement must remain simple, unsophisticated, a honest approach to the conceptual design, not supported by pretentious materials or sophisticated systems. I tried to use as little graphics or decorative elements as possible to illustrate the concept, functional objects must do that. The shape of those object should tell the story. A peculiarity of this arrangement is the fact that none of the objects used were purchased. All items being manufactured under the project. The shapes and positions of the objects in central space was designed so as to create several routes for equal exposure of the emblematic products. These objects have resulted from a formal synthesis by illustrating a number of three animals in motion. Zoomorphic design and geometric shaping almost extreme minimal tried to minimize the decorative approach. The use of very sharp angles (most angles on vertical objects under 45 degrees), gave more dynamism in the composition of objects, seen from different angles, they can change appearance. I also preferred not close volumes for spatial geometry without spatiality, a kind of origami like 2D shell, which is in constant metamorphosis. I used the ceiling to illustrate the trees made of black electrical wires which is also the lighting system, ceiling grid was invaded by black wires tensioned using weights that disguises lamp socket. Dressing booths are like a refuge in the middle of a forest. Suggesting a sort of "glazing" to the rest of space, a media interface, composed of LCD screens, is placed on the exterior wall of the cabins. To display accessories and jewelry we created rectangular prismatic objects at different heights which seem to emerge from the floor surface in various areas with apparently random positioning. The light trees are made from black electrical cable, energy saving light bulbs, cable clamps. The Weights which masks the light bulb sockets and tensions the cables, are made of painted metal pipe segments in black electrostatic paint. Objects displaying accessories are made of black and transparent Plexiglas.